The world of optical technologies is rather conservative and manufacturers rarely indulge users with interesting innovations. In this article you will learn about the Lightscribe technology. It has nothing to do with advanced data storage technologies, it just adds new interesting and useful features to standard devices. Since the time recorders got widely spread, users have faced the problem of marking recorded discs. There used to be many solutions, from primitive markers to special ink-jet printers. 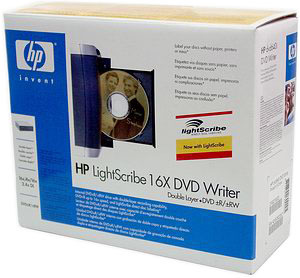 And here is the logical conclusion of this quest - the Lightscribe technology, created by HP. The idea of the new technology is very simple: we have an optical system that can write data by burning pits in the recordable layer with a laser. What if we use the same laser to burn labels on the back of a disc? However, the standard optical disc cannot do this trick - at first it should get special coating. What do we need to see this technology in action? A drive that supports Lightscribe, an optical disc with special coating compatible with this technology, software to create and burn labels. Quite a large tool kit to create proper conditions for the new technology, don't you agree? But it's not as gloomy as it seems. Most developers of disc burning software have already included this technology into their programs. It's easy enough to overhaul a standard recorder to support Lightscribe. The only problem is optical discs, we are getting accustomed to this situation. 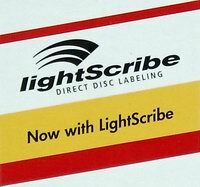 Unfortunately, optical media manufacturers still lag behind drive manufacturers, so we face two negative moments: problems with finding Lightscribe compatible discs and higher prices, compared to standard media. But let's wind up the introduction, proceed to HP 640 tests, and review the new technology by the example of this drive. Open the box and see what we got: the drive itself, two CDs with software (ArcSoft ShowBiz, Sonic RecordNow, CyberLink PowerDVD, SureThing, one recordable Lightscribe CD-R (it looks like a regular Printable CD, but the work layer is not white but impure yellow), and a stack of usage instructions on all languages of the world. The front panel of the drive houses: one-color busy light, emergency eject hole, Open/Eject button. The tray is made of black plastic and is equipped with a padding to reduce the noise and dust penetration inside the device. The rear panel of the drive contains an operational digital audio-out. The label on top of the recorder provides basic information on the manufacturing place and date, as well as on the firmware and circuit design version. If you examine the label, you will see that this drive is an OEM modification of a drive from Benq. To be more exact, it's the DW1625 model. Let's have a look inside the drive as it's interesting to know what chipset is used and what changes are made in the mechanism to support Lightscribe discs. Unfortunately, the thermal interface "has bitten" almost the entire chip designation, so I couldn't take a good photo. 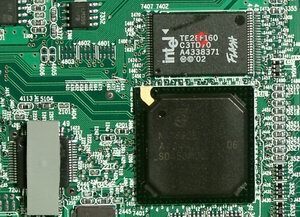 The drive is based on the PNX7860E chipset from Philips. 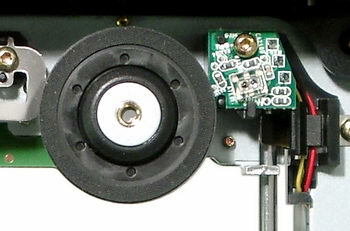 The photo below shows the innards of the drive. I've found an additional optical sensor near the engine, which is used by the drive to detect and work with Lightscribe media. 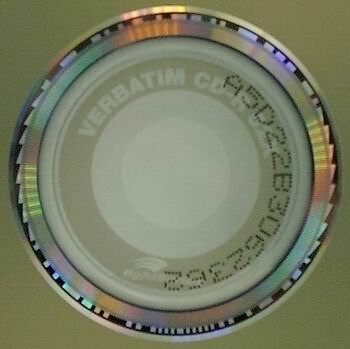 This sensor reads a special code on the inner circle of Lightscribe discs, near the beginning of the recordable zone. The installation caused no problems. Users have to go through a standard procedure, like that of an ordinary CD-ROM drive. The drive requires no special drivers. You may use the bundled software, which can satisfy any user. If you use NeroBurning Rom, you'd better download the latest version to get all Lightscribe features. Now let's use various utilities to get some information on the drive. You can roughly find out supported formats and disc types using Nero Infotool. 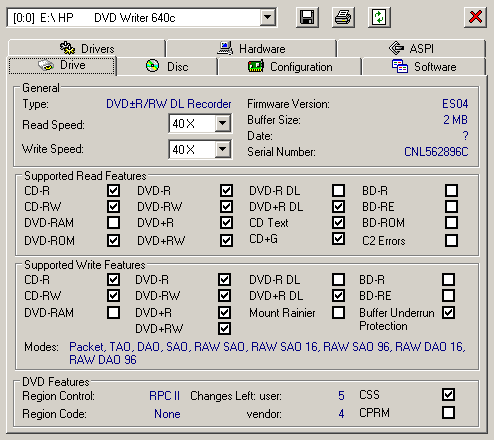 As you can see on the screenshot, the drive is initially RPC-2, but according to www.rpc1.com, there is an option to flash a new firmware version (which is still a beta) and make this recorder multi-zone (RPC-1). The data about its Audio CD capacities was obtained from the popular EAC program (EAC Configuration Wizard results). If you want to analyze detailed test results, you may find them here. So, you have recorded a Lightscribe compatible disc. Now eject the tray, turn over the disc with its recordable layer upward. Now you are ready to create a label. The drive comes shipped with the SureThing package, which allows to create any labels. If you use NeroBurning Rom, it contains a simpler utility with similar functions. The process of creating a label is simple and intuitive, but if you want your own graphics design, you will have to use an external graphics editor. You will be prompted to select the image quality after finalizing a project, right before burning the image. The time it takes to create your label depends on the image quality and the label area. Normal 3 min - 28 min. Draft 2 min - 20 min. Unfortunately, we had only one Lightscribe disc, so we didn't have an opportunity to compare image quality with various settings. 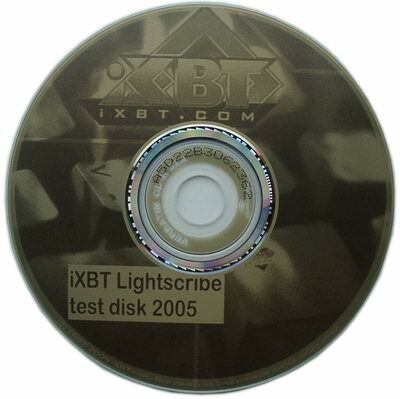 The work surface of a Lightscribe disc is impure yellow. When burned, the color changes to various shades of gray up to almost black (depends on the intensity). Despite the significant palette limitations, the resulting labels look highly professional. HP promises that these labels will be rather durable and will not decay under direct sunlight. Let's review peculiarities of this recorder with various media types. This drive records DVD+R DL only at 2.4õ., it automatically sets Book Type to DVD-ROM, which is necessary for maximum compatibility with old DVD-ROM drives and consumer electronics. DVD+R DL record quality is good, consumer electronics had no problems with detecting and reading all recorded discs. The drive can speed up to 16x when recording DVD+R discs. The recorder uses the CAV technology to burn DVD+R discs at 16õ. At lower speeds the drive switches to the P-CAV mode. 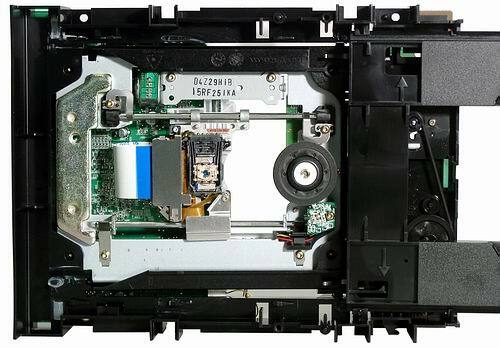 Here is what the recorder demonstrates in case of DVD-R discs: the maximum speed for this media type (DVD-R) is 8õ, discs are burnt in the P-CAV mode. 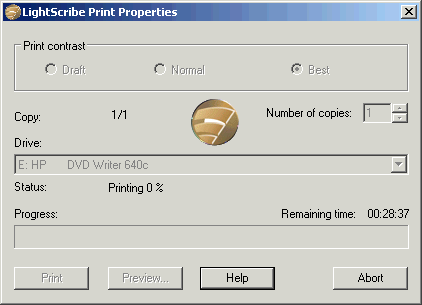 The recorder can burn DVD+/-RW discs maximum at 4õ. In case of proper discs it can use CLV. These are the results of the burn quality tests of various DVD discs: on the whole, the recorder copes rather well with DVD+R/RW discs, the level of PI/PO errors is rather low. 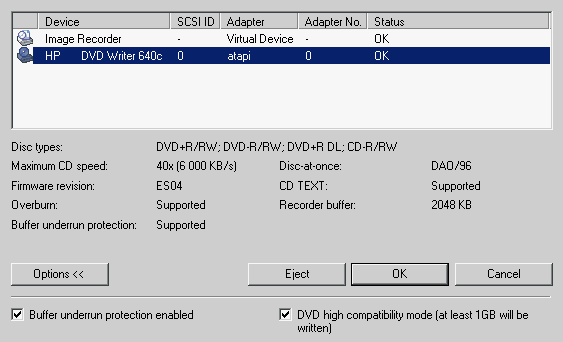 The situation with DVD-R/RW media is gloomier, the recording quality is much lower, and other optical drives sometimes have problems reading these recorded discs. The recorder reads various DVD types quite well, it uses the CAV mode. The maximum 16õ read speed is obtained with stamped DVD-ROM discs. CD characteristics of the recorder allow comfortable operations with any CD types. The recorder uses CAV technology in most cases to burn various CD-R media. 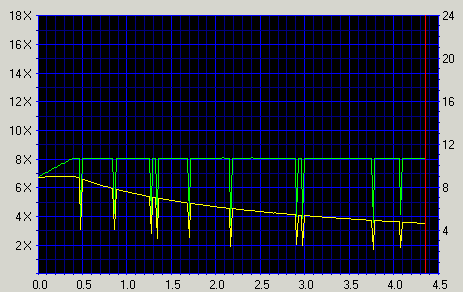 In this case recording starts at 16õ and gradually grows to 40õ. What concerns CD-RW, CAV technology is used to burn 10x discs; Z-CLV is used for burning 24õ discs. We have no complaints about the quality of CD-R/RW discs burnt by this recorder, all the discs are readable and the level of Ñ1 errors is rather low. The recorder reads various CD types very well, there were no problems with reading low-quality CDs. 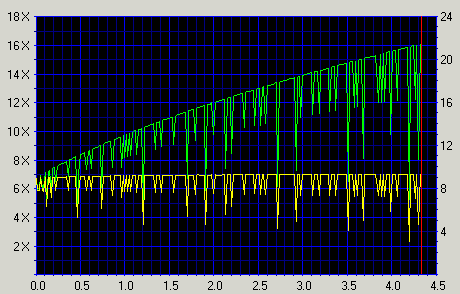 The noise when reading a CD at maximum speed is not very high. It's high time that we analyze pros and cons of the new Lightscribe technology. Of course, so called pros and cons may vary at different points of view, so everything below is my personal opinion. 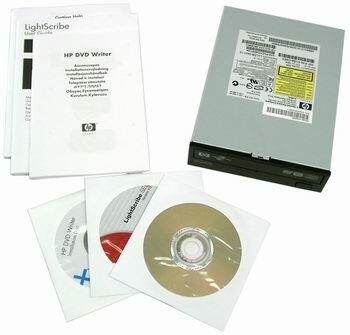 Lightscribe technology is certainly a very useful addition to the standard features of optical drives. The quality of labels is almost on the professional level and users don't need extra equipment to do this. Label designs are now up to the flight of users' fancy. These are good points, and now let's review possible disadvantages. The label palette is limited to the grayscale. Color modifications may appear in future, but it's too early to speak about them so far. Availability and prices for Lightscribe media are still dubious. If the industry supports the new standard, the mass production should drop the prices. The same concerns availability of the drives, the market offers just several modifications and their technical characteristics are far from ideal so far. However, considering that this technology is promoted by such large companies as HP, BenQ, and Lite-On, we can hope to see a larger range of drives supporting Lightscribe in the nearest future. 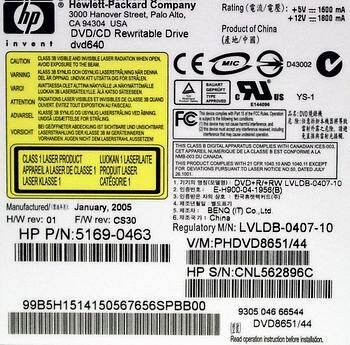 HP 640, which we used to review the new technology, obviously needs improvements in DVD-R/RW recording quality. On the whole, it doesn't shine in modern technical characteristics. In other respects, we have no serious grudge against it. On the whole, we can recommend it to those who mostly use DVD+R/RW media.